MILWAUKEE — Matt Albers won’t be available Wednesday afternoon when the Milwaukee Brewers wrap up their three-game series with the Chicago Cubs at Miller Park. The Brewers placed the right-handed reliever on the disabled list Tuesday with a strained right shoulder following a disastrous showing Monday night in a loss to the Cubs when he allowed a season-high five runs in the 11th inning of a 7-2 Brewers loss. Albers was a big part of Milwaukee’s bullpen’s early-season success. While Josh Hader and Jeremy Jeffress attracted most of the attention with their dominance, Albers went 3-1 with a save and a 1.08 ERA through his first 21 appearances. Things took a turn, though, when the calendar flipped to June. Albers posted a 19.64 ERA over his last four appearances. “He got to the point where it was affecting him out there on the field and it’s just time to take a break,” Counsell said. 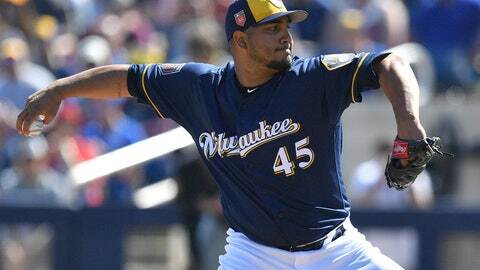 Milwaukee recalled right-hander Jorge Lopez from Triple-A Colorado Springs to fill Albers’ spot on the roster and hands the ball to right-hander Jhoulys Chacin on Wednesday in the series finale, looking to extend their half-game lead over the Cubs in the National League Central. Chacin has been stellar of late, going 5-0 with a 2.92 ERA over his last 11 starts and is 5-1 with a 3.58 ERA in 15 starts this season. “He’s doing what he’s good at,” Counsell said. “He’s executing what he’s good at. It’s a sinking fastball, it’s a very good breaking ball. It’s a sprinkled-in changeup to left-handed hitters. Chacin hasn’t faced Chicago since June 20 of last season but is 2-4 with a 3.82 ERA in seven career outings (six starts) against the Cubs. He’ll match up against Cubs lefty Mike Montgomery, who’s filled in nicely while Yu Darvish recovers from right triceps tendinitis. Montgomery is 2-0 with a 1.02 ERA in three starts this season after holding the Pirates to a run over six innings his last time out and is 2-1 with a 3.56 ERA overall this season. “What he’s showing right now is how good he actually is,” Cubs manager Joe Maddon said. Montgomery has served as the Cubs’ swingman since he was acquired in a trade ahead of the 2016 deadline. He made it known over the winter that he’d prefer to be a full-time starter but has embraced his current role without issue. Maddon respected Montgomery’s candor and appreciates his willingness to put the team first. Darvish meanwhile took a step forward Tuesday. The right-hander threw off a mound for the first time since May 26 during a 30-pitch bullpen session in Milwaukee. He reported no issues during the workout and will be re-evaluated Wednesday morning. There is still no time table for Darvish, who is 1-3 with a 4.95 ERA in eight starts this season, to return.